Our brand new taproom is a work of art, blending the charm of a German beer hall with Sonoma County wine country style. With over twenty fresh beers on tap, the taproom serves as a great location to plant oneself to try all of our beers. Our award winning ales include Sonoma Springs Kolsch, Lil’ Chief Strong Pale Ale, Roggenbier Rye, and our New Bavaria NomaWeiss Wheat! 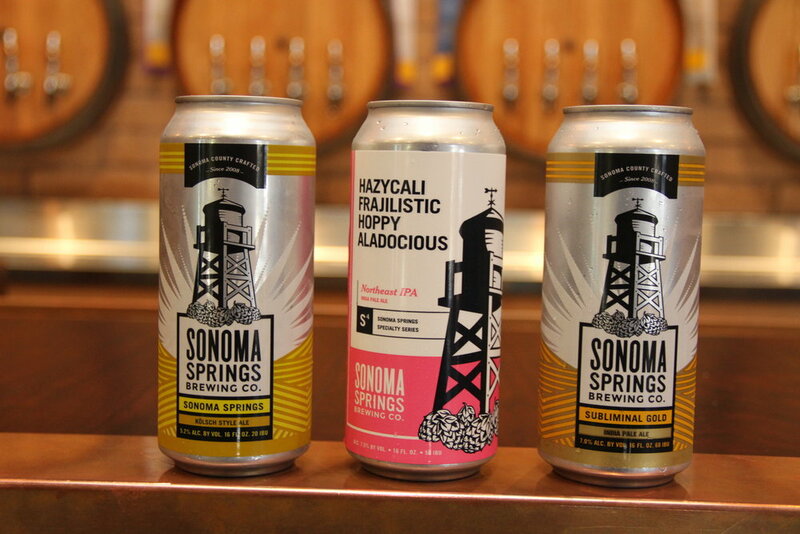 Whether you’re on the go or looking for a place to hang out, Sonoma Springs Brewing Company has a little something for every lover of good beer. Looking for a special place to host your private party? Look no further, with relationships with some of the best local caterers in Sonoma and tons of fresh beer, we can create a unique experience for you and your group! COMING SOON: Swing by the Taproom for a pint or tasting flight. Can't stay? We also offer Growlers (64 oz) or Howlers (32 oz) for take away. Tours are available with advanced notice, call us to schedule your unique Sonoma Springs experience today! Looking for fresh Sonoma Springs beer for your wedding, birthday party, of BBQ? We have got you covered! We offer most of our beers in 5 and 15.5 gallon kegs. We also offer Jockey Box and CO2 rentals!